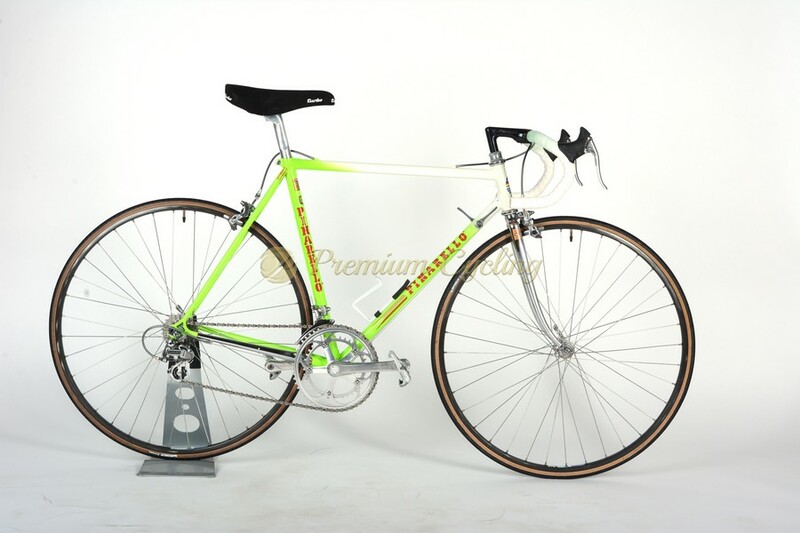 Pinarello Gavia was released in early 1990s as successor of the Montello SLX, and was the top model, named by magnificient climb Gavia in Dolomites. Creating Gavia, Pinarello departed from his standard production design with parallel seat and head tube angles, because Greg LeMond, the winner of the Tour de France in 1986, 1989 and 1990,promoted designs that pushed the saddle further back and Gavia provided further saddle back than any other Pinarello model. 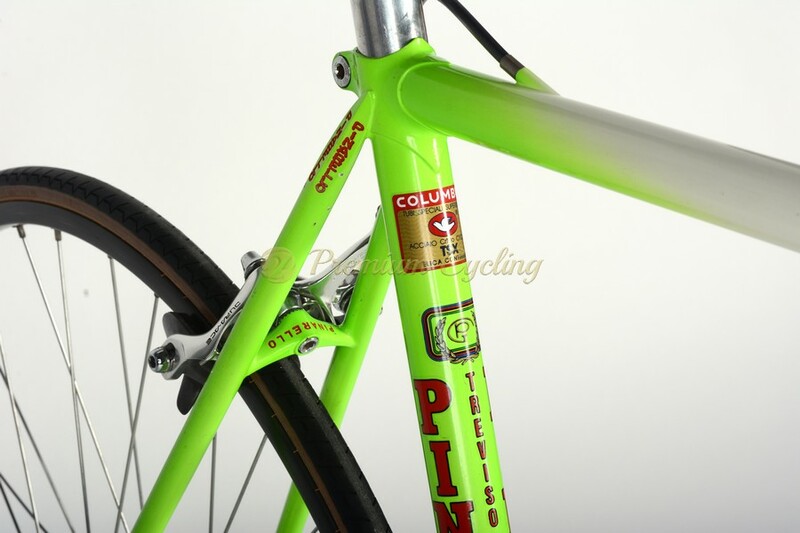 The Gavia was constructed of Columbus TSX tubing. , lighter than SLX and suitable long-distance races. This model was available in red, blue with pearl white panels and pearl white with fluorescent splatter. This very rare paint Pinarello Gavia arrived at Premium Cycling in original condition and is equipped with a complete top-class Shimano Dura Ace 7400 groupset, 3ttt stem and handlebar and Ambrosio Super Elite wheels. 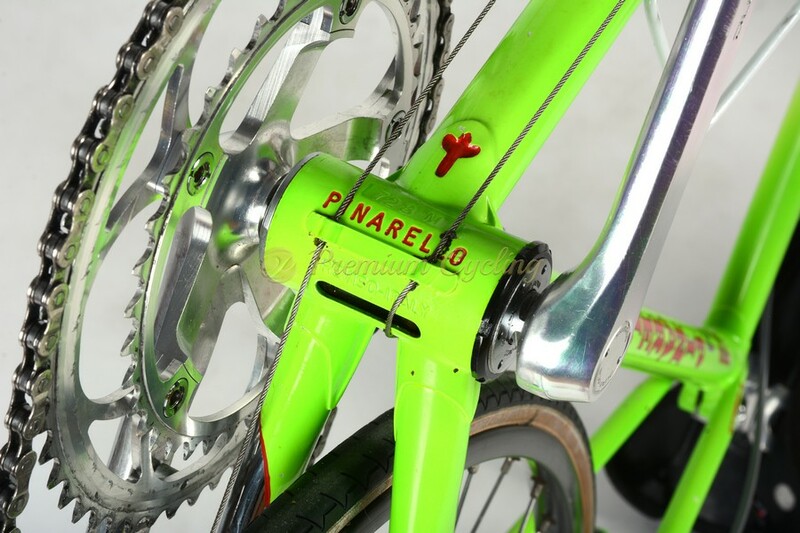 A must-have for Pinarello collectors! Condition: Used, but in good condition. The frame has no cracks or dents and is not bent. The original paint and decals have a few touchups of normal use, otherwise it is in very good condition. All parts are working fine. * Due to copyright reasons the photos are in lower resolution and marked with watermark. If you are interested, please contact us and we can send a high resolution photos.